Prop D, the soda tax, has passed. If you can’t ban it, tax it to death. That’s the mindset of governments, who are increasingly attempting to legislate America into better health. Their arch-enemy? Coca-Cola, Pepsi-Cola, and all the other Cola companies and soda pushers. New York banned Big Gulps; Mississippi passed a Freedom of Soda act in retaliation. However, in Berkeley, California, you can get any size soda you want, provided you’re willing to pay extra for it. Berkeley is the first city in the US to pass a soda tax on sugary drinks. Needing only a 50% majority, nearly two-thirds of Berkeley-ites voted in favor of the cola-crushing tariff. The tax adds a penny of tax per ounce of sugary drink. Another tax on the ballot at the same time in San Francisco, which added two pennies of tax per ounce of drink, failed at the ballot box. There have been 30 different efforts to tax sugary drinks, and all of them have failed until now. 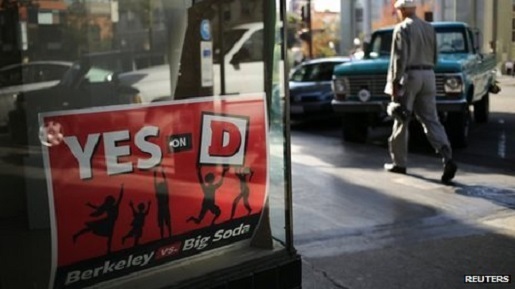 The race brought in millions of dollars in advertising on both sides of the issue, with the soda lobbying groups trying their hardest to make Berkeley’s effort the 31st failed attempt at a soda tax. They failed, and they’re pitting the blame on the so-called “Berzerkley” residents themselves.